Craving the best smoothie of your life? Made with organic ingredients grown locally, right on the grounds of the most adorable little stand ever? Then it’s time to head over to What’s Shakin’ on the Hilo side of the Big Island. 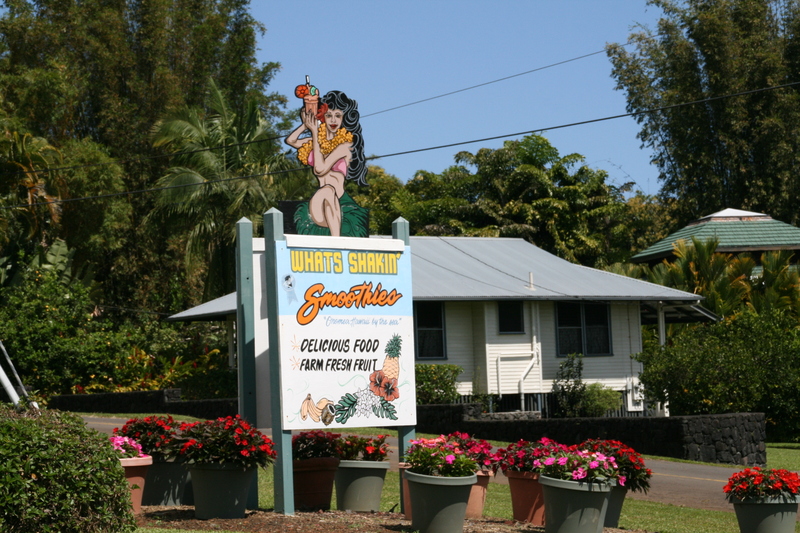 What’s Shakin’ is located at 27-999 Old Mamalahoa Highway, the 4-mile scenic route, in Pepeekeo. 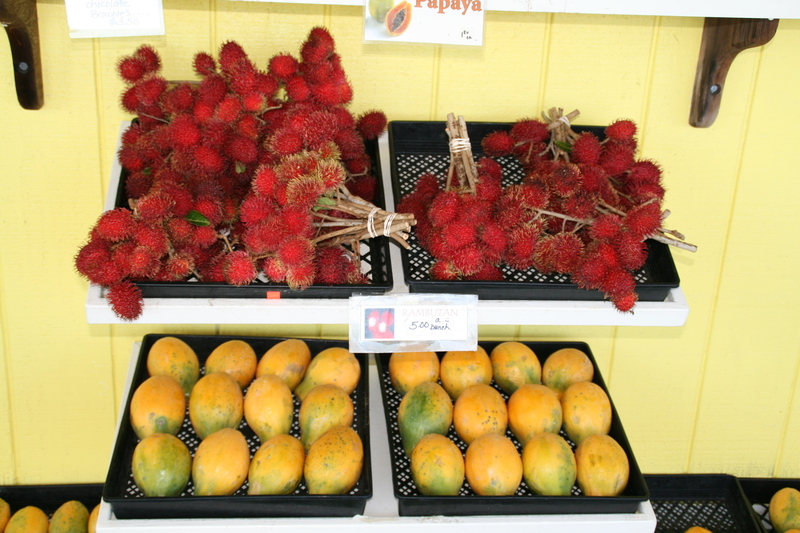 It’s a great place to stop on your way to the Hilo side of the island, or to make a stop if you are staying near Hilo. Earlier this year, we stopped on our way to the Hawaii Tropical Botanical Garden for lunch. We had a smoothie for lunch and split the most delicious ahi tuna wrap with fresh avocado. This is one of the freshest, most delicious lunches or snacks you will ever find. They also sell the organic fruit they grow right on the grounds. Yum. The smoothies? I highly recommend the Bananarama or the Peanut Braddah (banana, peanut butter and chocolate and milk, but I ordered it up with mac nuts). I might need to go back to eventually try all of them. 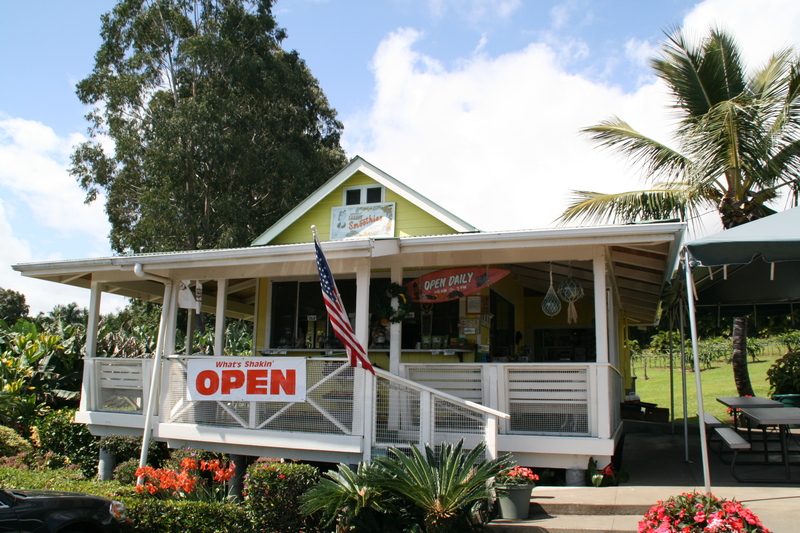 As if the 4-mile scenic drive wasn’t enough after the drive over from Kona with its twists and turns through gorgeous gulches and views, you make the turn to the scenic drive and suddenly, there you are—at the What’s Shakin’ stand just in time for lunch or the perfect afternoon snack. The service at What’s Shakin’ has always been friendly. They have picnic tables for you to leisurely enjoy your smoothie or lunch. The view? Well, how about the lush green of the Hilo side along with flowers and the ocean off in the horizon? Doesn’t get better than that.